Cargo Velocity's Feasibility Planning quickly delivers planning and analysis for a specific operational concept. For example, every year we conduct assessments of the applicability of automation, long-term terminal cargo capacity and throughput potential including return-on-investment. We have developed a range of planning methods and models that enable us to complete these studies quickly. For example, in one-week, we have been able to make site visits, do interviews, prepare long-term conceptual plans for automation, perform a capacity analysis, and make first estimates of capital costs. Typically, we work with local civil/structural engineers, an economist, and an equipment evaluation specialist to produce informative data. 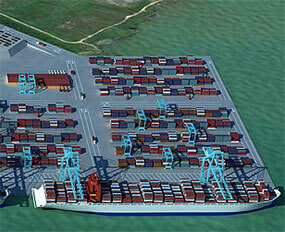 Developed conceptual master plan for container and dry bulk facilities in the Port of La Brea. Accommodated required throughput in a multi-use terminal facility. Developed conceptual plans, estimates, 3-D renderings, and a video to support presentations to government officials.